Edo State government has increased fares for Libya returnees from N1,000 to N5,000. This followed yesterday’s protest by the returnees that N1,000 was not enough to take them to their destinations. 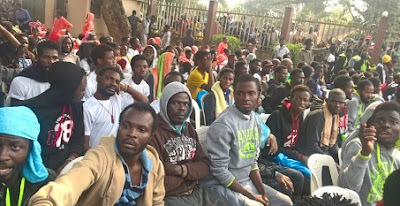 The government said it was committed to the payment of N20,000 monthly stipend to every Edo indigene deported from Libya. It said the stipend would last for three months. The returnees, who were on the verge of storming out of the hotel to protest in the streets, were assuaged after the increment. The Chairman of the Task Force on Anti-Human Trafficking and Illegal Migration, Prof. Yinka Omorogbe, attributed the protest to misinformation. He said the returnees from Port Harcourt hoped to get money like their colleagues evacuated and paid by International Organisation on Migration. Omorogbe, who is also the attorney-general and commissioner for Justice, said the government was discussing with the Federal Government on how to care for the returnees. She said the stipend was not paid at the venue of profiling the returnees. Her words: “When they come to Benin, we have a package for them. We give them a pack for their essential needs. We profile them, we do medicals for them, we do counselling for them and we keep them for a couple of days for those who wish to stay. “We have a stipend programme of three months for every returnee. It is not available immediately. We do not start payment immediately. Their biometrics are taken by the revenue service. They open an account and pay the stipend into it. We have paid for the first few set of returnees. We do not give money at the venue. On the designated day, they will receive message from us and get their money. “The returnees from Port Harcourt were brought under a different regime. I am told they were not paid any stipend. These people from Port Harcourt, maybe they have been told about our stipend and the money others got from Lagos and believed they would get the money immediately. We decided to manage them and opted to give them some money for transport. It was not what we planned. These ones see themselves as not getting the same standard of treatment. “You can see that they have calmed down now. The fact is we have two categories of returnees. What we have done is a proof of the proactive nature of Governor Godwin Obaseki. No amount has been approved to be given to returnees at this stage. “We are discussing with the Federal Government. Everything the state government has promised to do is what we are doing. We have not deviated from our promise. » Free 100MB On Your Every N1000 Recharge On Your Glo Line.